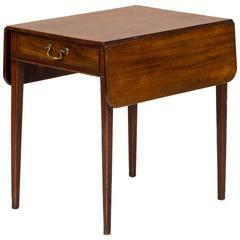 An interesting solid flame mahogany top drop-leaf game table with quartered corner inlay of chestnut at all corners. Having a detailed carved edge of flowers above a flame apron with a stop and go border above slip carved knee, and standing on tapering cylindrical legs ending in a pad foot. Single swing leg supports the lifted top. American, circa 1820. The drop leaf measures 15.25 inches. 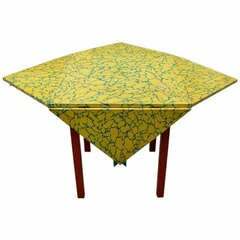 This elegant felt surfaced game/ side table measures 28.5 inches high, 25 inches wide and 16 inches deep when folded. 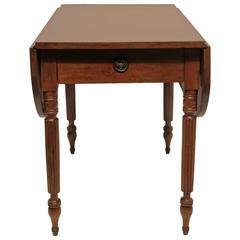 Elegant mahogany occasional table that has fold down leaves and can create game table when leaves are in up position. Inlay runs throughout the piece. 19th century Pembroke drop-leaf mahogany table with single drawer. Table extends to 31 1/4" when leaves are raised. 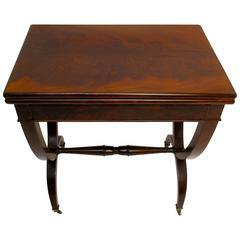 Early 19th century Georg III pembroke mahogany drop-leaf table. 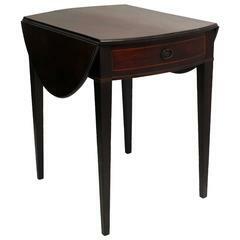 American Federal period mahogany game table featuring satinwood banding, Sheraton style legs and felt under lift top. Classic style.